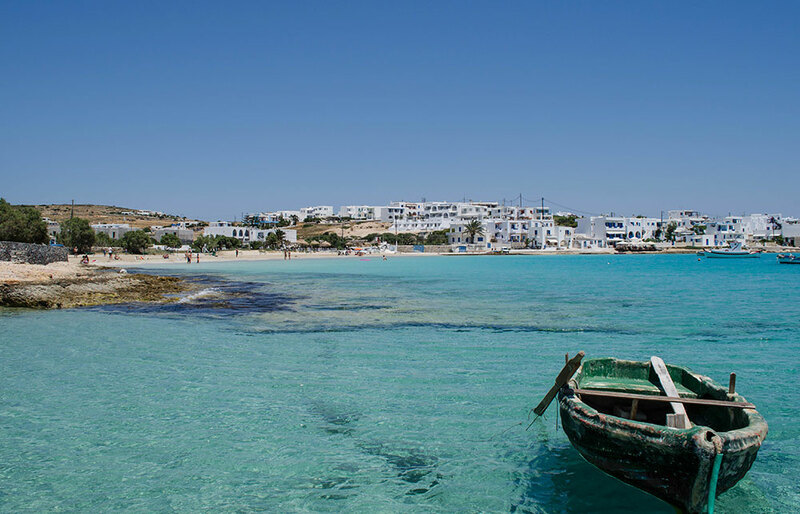 Koufonissia islands are undoubtedly the rising star of the Aegean, referred by the locals as the “Mykonos of the Small Cyclades”. Koufonissia comprise of two islands, Ano Koufonisi, one of the lively, popular touristic spots in the Aegean, and Kato Koufonisi, almost uninhabited island known for its unique coastline formations and extraordinary beaches. Whatever these two small islands lack in size they replenish in landscapes. 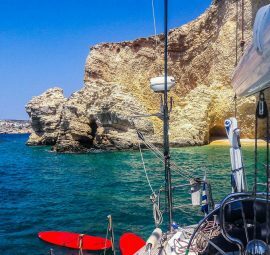 Words fail to describe how one feels when visiting Koufonissia islands for the first time. They are everything you expect to see in Greece: exotic turquoise waters, sunkissed beaches, impressive sea caves, rocky formations carved by the waves, whitewashed houses, blue windows, picturesque narrow alleys, atmospheric shops and friendly atmosphere. 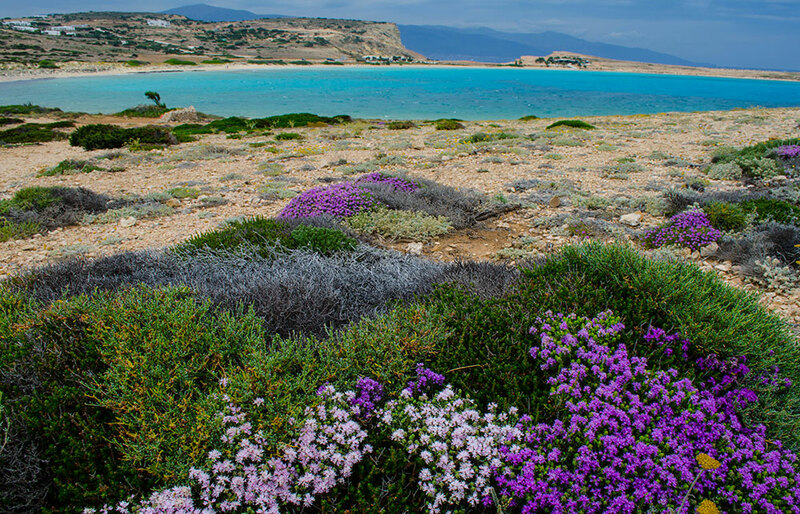 For many years these two islands remained the unexplored paradise of the Cyclades. Today, they have become a favorable destination, but still retaining their low key charm and relaxing atmosphere. 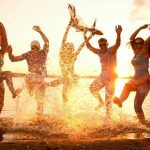 Here you will get a sense of a truly exotic paradise and an unpretentious summer holiday, ideal for families, group of friends or even romantic getaways. Caves of Xylovatis: are situated north of Pori beach. There are two striking caves on the peninsula of Xylovatis that can only be accessed by sea. One of them has also a small secluded beach inside, ideal for those looking from isolation and relaxation. Devil’s Eye: is small cave with an impressive phenomenon. When there is a current, the sea comes up and floods the rim of the cave to be sucked back down again. Devil’s eye is on the path from Platia Pounda to Pori and it is a natural pool where swimmers love to explore underwater. However, bear in mind that its entrance is not visible from the main path. 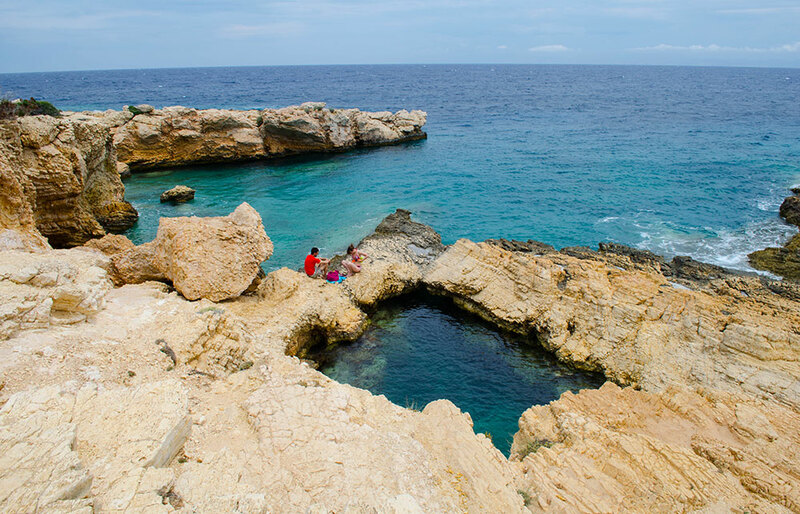 Pisina: is an impressive natural pool formed on a rocky cliff. This small pool can host several people to swim in and is also suitable for diving. Pisina is located on the path that connects the beaches of Platia Pounda and Pori. Gala (or Tripiti): is an irregular geological formation containing a small, secluded beach which is accessible, but at the same time, not visible from the sea due to large rocks hiding it. The beach extends under a huge rock forming a natural pool. The name Gala (ie. Milk in Greek) derives from the whiteness of the color of the water inside the cave. To visit Gala you should look for an opening in the ground of the hill at the very end of the beach of Pori. Folklore museum: includes a broad collection of domestic utensils, farm tools, garments, frames, and furniture that signify the islands’ history and cultural heritage. The museum is located right next to Agios Georgios church in Chora. Hiking in Ano Koufonisi: is the best way to see the island and acquaint yourself with Ano Koufonisi’s unique beaches. There are 2 paths starting from Chora. One that goes around its picturesque coastline and another one that leads to Pano Meria, the highest point of the island. Karnayo (shipyard): is a traditional repair and maintenance boat yard, situated in the Loutro area. Koufonissia has one of the biggest fishing fleets in Greece in proportion to their size and population. In Karnayo visitors can watch work carried out on boats in the good old-fashioned way, as it remains exactly the same for several decades now. The ancient settlement of Epano Myloi: is located at the western side of Ano Koufonisi. Excavations have brought into light various items that date back to the 3000 BC. Findings from Epano Myloi are hosted at the Archeological Museum of Naxos. Traditional Windmills: stand proudly in two locations in Ano Koufonisi. One is just above the port and the other one close to the shipyard. Both were used for grinding wheat intro flour back in the old times. Today the port windmill has been converted into a bar, while the shipyard windmill has been converted into a tourist resort. Church of Panagia: is located in Kato Koufonisi. The beautiful chapel was built in 1651, during the Ottoman rule, just above sea level so that it wouldn’t be visible from the sea and wouldn’t be noticed by the Turks. 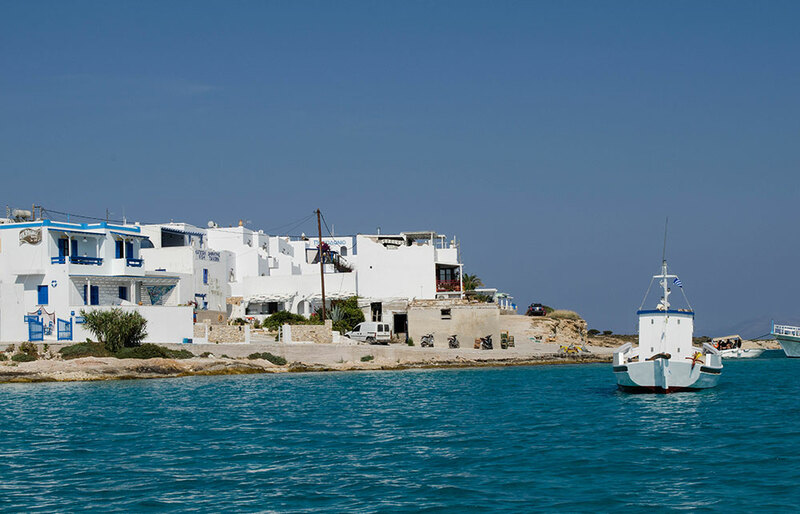 Ano Koufonisi is the smallest inhabited island in the Cyclades with 440 permanent residents. Because of its size, just 3.5 km2, most places on the island can be reached on foot. Although cars are allowed on the island, there are no cars or motors available for rent, only bicycles. The only village on the island is Chora, which is located on the south side of the island and is both the capital and the harbor of Koufonissia. 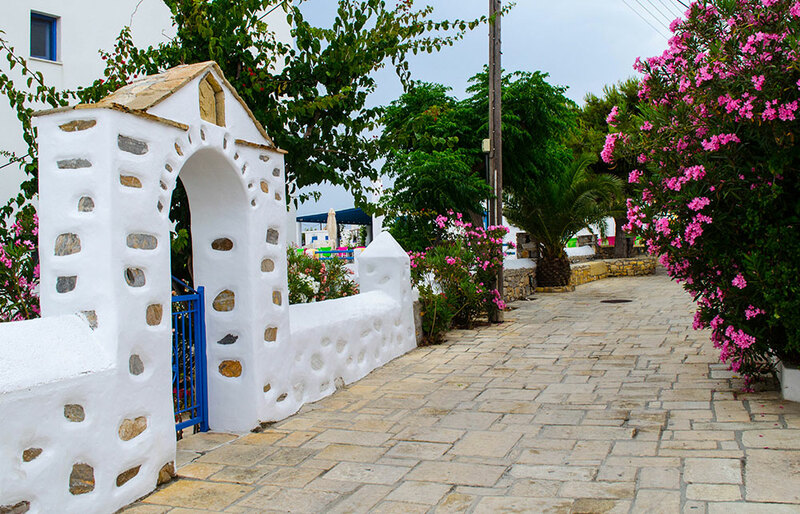 Chora is a classic example of traditional Cycladic architecture with picturesque whitewashed houses, narrow paved alleys with flowery house yards, a stone windmill and a blue dome church. The main street of Chora is filled with rustic and slightly 60’s pop restaurants, pleasant bars and charming shops.This small street lights up with life at night. Most of the accommodations are also located in Chora. 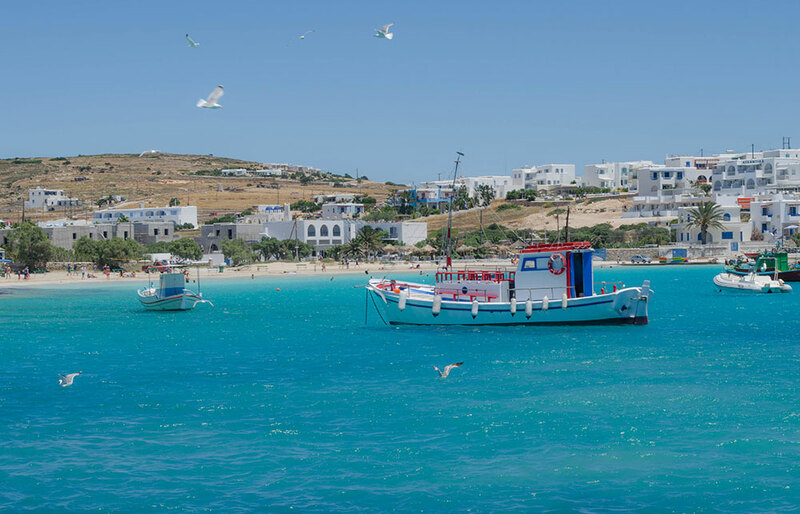 Highlights include apicturesque fishing port that stands out due to its exotic turquoise waters, as well as the traditional windmill just above Chora’s harbor. Kato Koufonisi is divided by a narrow strait from Ano Koufonisi and it takes approximately a 10min boat ride to visit. The island is mostly uninhabitedwith very few houses build on it, a taverna, a chapel and a small port. There are no accommodations on the island; however there is aprivate fenced area next to Lakki Beach (in the west) where free camping is allowed. 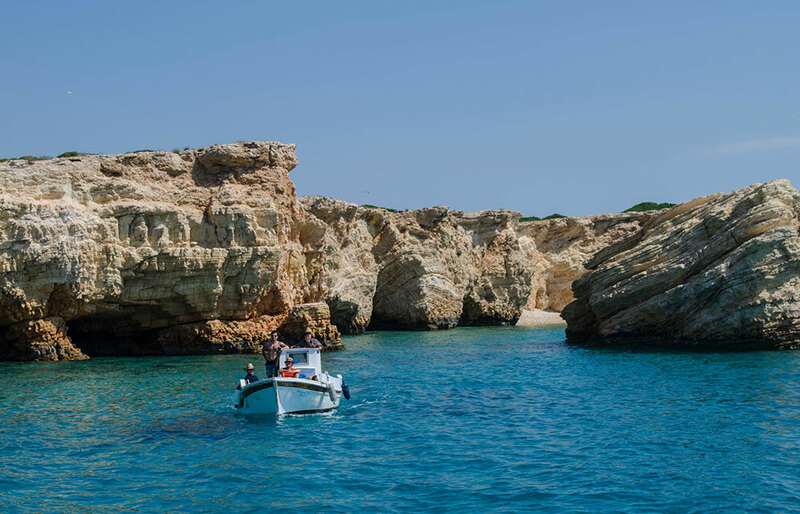 Kato Koufonisi is ideal for nature lovers as it provides the perfect opportunity to explore virgin unspoiled landscapes, unique caves and rocky formations. The last inhabitants of the island abandoned it at the end of the 1960s, leaving an old deserted settlementbehind. Since then there was little to no human interference. In Kato Koufonisi you will encounter wild birds, goats, sheep and lush vegetation. Moreover, the island is blessed with striking geological formations, turquoise waters and serene beaches. A definite must visit! 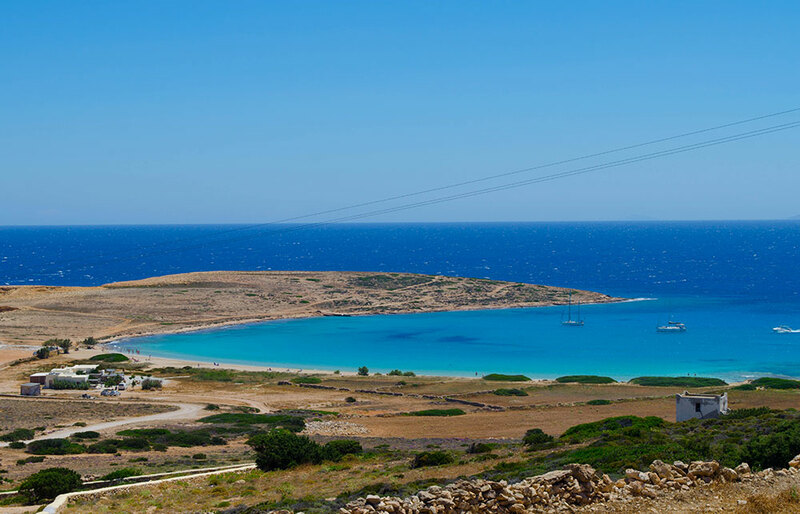 Half a mile across Koufonissia is the legendary island of Keros. 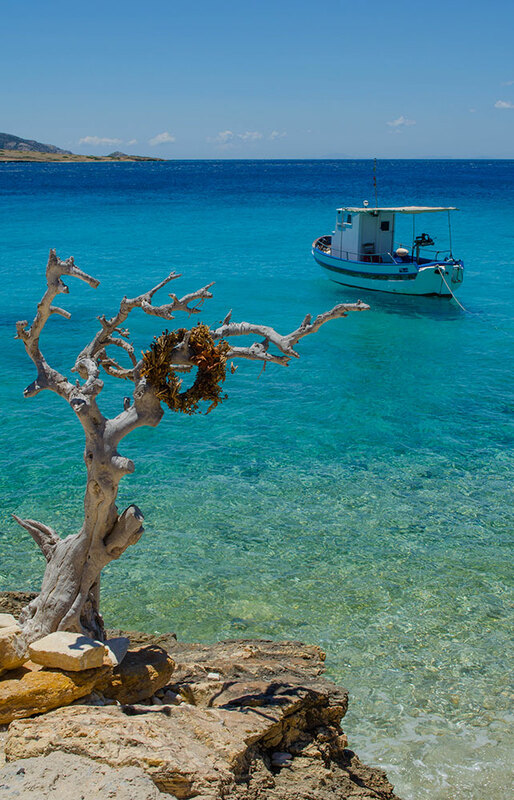 Keros is a small uninhabited island that belongs to the municipality of Koufinissia and is considered to have been one of the most important centers of the Cycladic civilization. During the Early Bronze Age, the island was the world’s earliest maritime sanctuary and a thriving center for metal production. Excavations have brought to light important findings including marble statues, stone utensils, ceramics, obsidian blades and the remnants of a Cycladic cemetery at the islet of Daskalio. Most of the findings are kept at the archeological museums in Athens. Today, Keros is an important archeological site and it is forbidden to set foot or docknear the island. Glaronisi is a small uninhabited islet located in between Ano Koufonisi, Kato Koufonisi and Keros. It has taken its name from the hundred seagulls (glares) that nest there. Glaronisi is ideal for isolation and relaxation. It has few small secluded beaches with crystal blue-green waters and interesting sea caves to visit. The islets are blessed with crystal turquoise waters, strips of golden sand, rocks carved by waves, and eccentric sea caves. 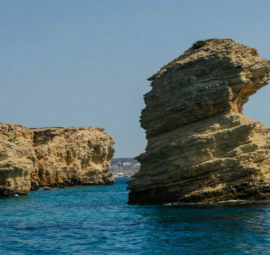 The shallow calm waters and sandy beaches make Koufonissia an ideal destination for families, nature lovers and water sports fans. 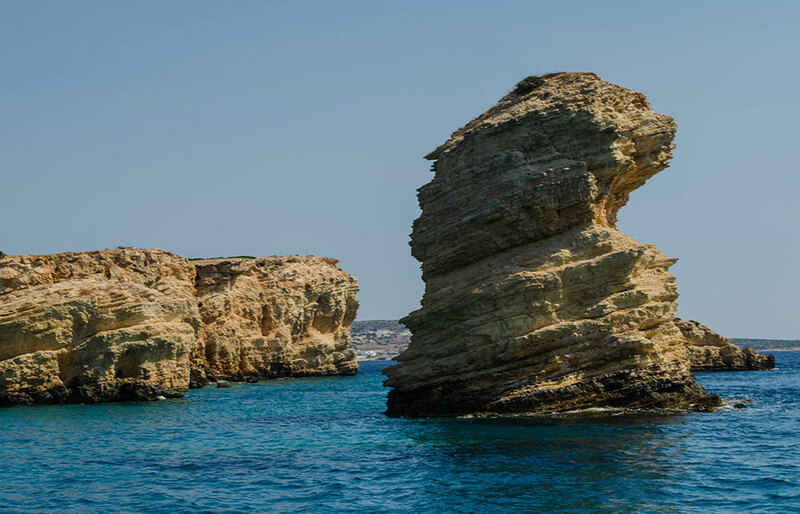 From kayak to scuba diving, there is something for everyone to enjoy in Koufonissia waters. Ammos: is the closest beach to Chora, right next to the port. It is a stunning postcard-like bay with turquoise waters, golden sand that enchants visitors with the view of the colorful fishing boats moored in its harbor. Due to its proximity to Chora, Ammos has direct access to restaurants and cafes. As all beaches in Koufonissia, it has crystal clear waters and is not organized. 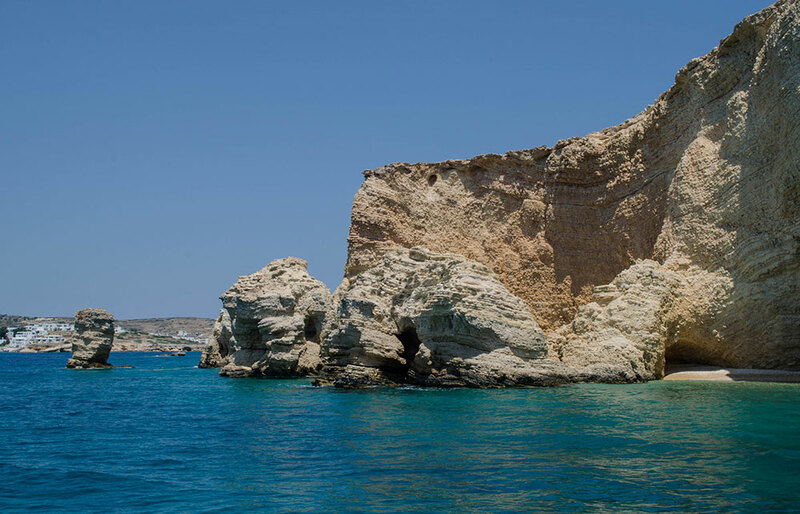 Hodros Kavos: is a small bay with blue waters, sand and pebbles close to Chora (850m). A few meters from the beach there is a café for snacks and coffee. There is also a taverna near the beach. Charokopou (Finikas): is a golden beach with turquoise waters, 1100 meters from Chora. Usually people refer to it as Finikas, after the restaurant that is on the beach. There is also a camping close to the beach. Access is possible by foot or boat. 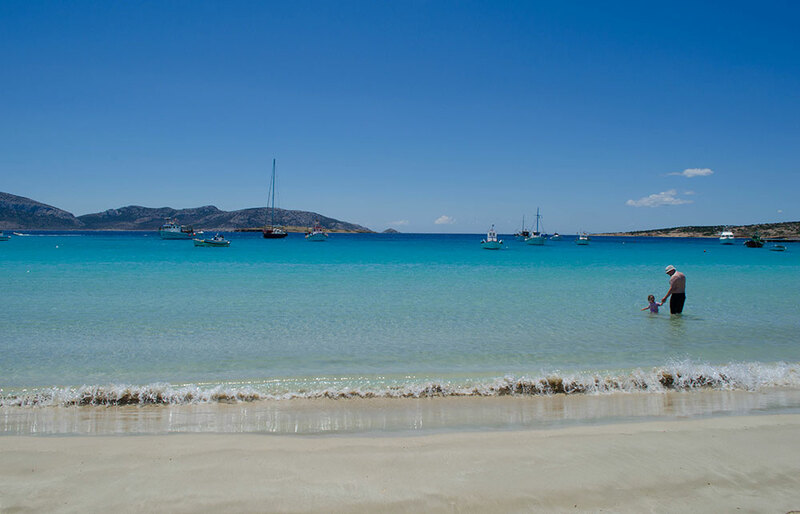 Fanos Beach: is a relatively long sandy beach with turquoise waters located next to Charokopou beach (1400m from Chora). There is a beach bar available. Platia Pounta or Italida: is a long beach with golden sand and calm turquoise waters next to the beach of Fanos (1800m from Chora).Is it considered one of the most hippy and popular beachof the island.“If you haven’t been to Italida, you haven’t been to Koufonissia” as the locals say. The closest amenities are found at the beach of Fanos. Platia Pounta is a great windsurfing spot if you have your own equipment. Pori Beach: is considered to be the most beautiful beach on the island.Pori is a golden sandy bay with stunning turquoise colors. Usually it enjoys calm waters, but when it gets windy it is ideal for windsurfing. There is a beach bar available that also serves a few local delicacies. 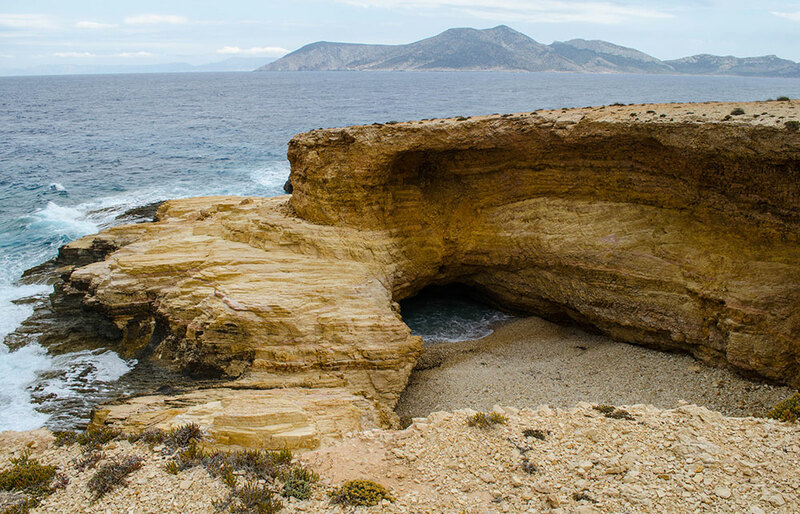 Near Pori one can visit some of the island’s highlights, like Gala beach, Xylovatis sea caves and Devil’s Eye. Access to Pori is possible by foot, car or boat. 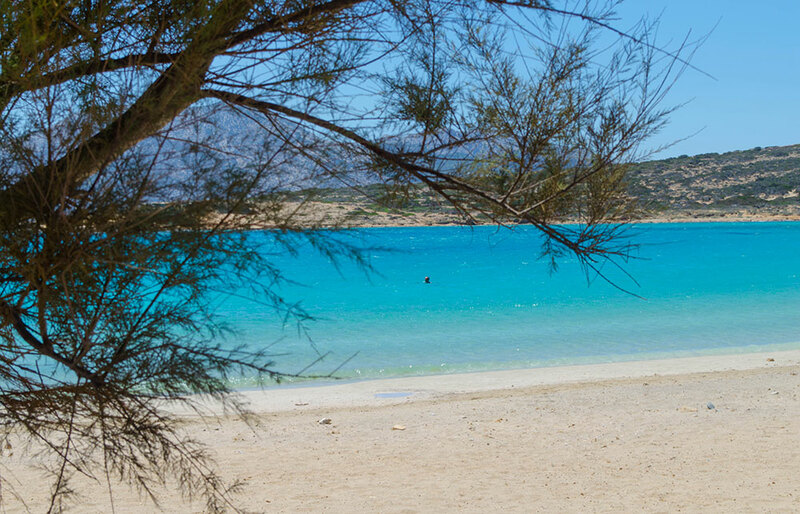 Detis: is a small sandy beach with turquoise waters near the port of Kato Koufonisi. Very close to Detis beach is the only taverna of the island. Lakki: is a small pebbly beach with aquamarine waters and rocky formations, situated close to the old settlement of the island. Kasteli: is one of the most impressive places in Koufonissia. It consists of two stunning beaches with big yellowish pebbles and turquoise waters. The beaches are found infront of steep crème cliffs. Big rocks form a passage that leads from one beach to the other and big scattered pieces of rock come out of the sea. 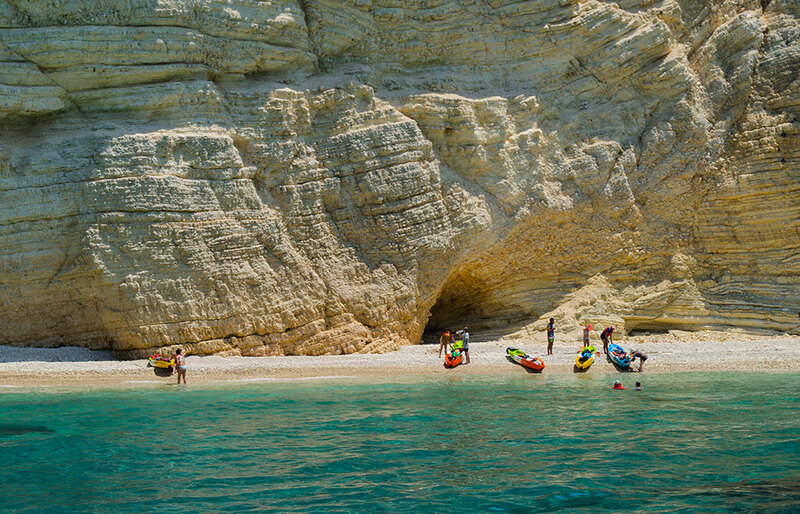 Kastelli’s extraordinary landscape is ideal for kayaking and cave exploration. A definite must see! Archeologists believe that Keros in the ancient years was considered to be one of the gates of Hades, the God of Death, where inhabitants from the neighboring islands brought their dead people. Another famous belief is that Keros is identified with “Asteria”, the birthplace of God Apollo and Goddess Artemis. Today, Keros is an important archeological site with still ongoing excavations and it is forbidden to set foot or dock near the island. Ancient Times: Koufonissia have been inhabited since the pre-historic times and were the center of the Cycladic Civilization. Findings date back to the Early Cycladic, Roman and Hellinistic period. Some of the most important include two famous statues of the harpist and the flute player that are kept at the National Archeological Museum of Athens, as well as another famous statueof a seated harp player hosted at the Metropolitan Museum of New York while the head of a female statue is exhibited at the Louve Museum in Paris. Medieval Times: Koufonissia had a similar history with the rest of the Cyclades. They came under the rule of the Venetians and Turks. Due to the common pirate raids the islands were almost deserted during this period. Recent Years: The two islets were liberated in 1830 and became a part of the Greek state. With the end of piracy, inhabitants returned to Koufonissia again. Agios Georgios Day: is the most important religious holiday in Koufonissia, since Agios Georgios is the islands’ patron saint. A local makes the round of the island holding the icon of the Saint, to honor him, while fish boats accompany the local by sailing along the coast. The celebrations end in Chora, with a big feast. 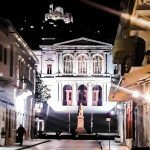 Agios Nikolaos Day: has been declared as a local holiday in Koufonissia and a celebration feast is held on December 6that the chapel of Agios Nikolaos. Prophitis Ilias Day: is celebrated on July 20th. 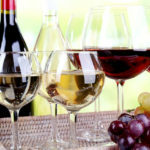 Fisherman’s Feast: is a movable feast with fish and seafood delicacies, traditional music, rakomelo and wine. Koufonissia have one of the biggest fishing fleets in Greece in proportion to their size and population, so it comes as no surprise that they held such an event.